When I was younger my grandmother would tell me stories of her life. She would tell me about where she grew up, the games she played and how essential it was for everyone in the family to work together. She grew up in a small town in Mexico called Cananea. Her father was an Apache Indian and her mother was what was a called a mestiza, a mixture of native Indian and Spanish heritage. Her parents showed her the importance of embracing both cultures. Her father built her mother a two bedroom house where she was born, then later on came three sisters. It was never boring having three sisters to play with. But playtime came only after chores were done. Chores included tending to the garden and the animals. Her father had an area of the farm where he grew corn. Her mother’s garden had herbs, and vegetables. But my grandmother grew her own garden. She loved to grow peas, only because she loved how pretty the flowers looked. She loved her life on the farm. She would rise up before the sun came up over the mountain and milk the cow. Then she would get some eggs from the chicken coop. Then she would go to the store house and get some dried beans and corn. Her little sisters started helping her when they were old enough. She would take all these things to her mother who would prepare breakfast, and start boiling beans and grinding corn for dinner. Her dad would work in his corn field from dusk to dawn, taking a break in the afternoon to spend time with his family. Life continued in this fashion for my grandmother for years. But one thing started to change. Her mother would forget things. She would forget people’s names, forget where she was, or where she was going. In those days, things like that weren’t as explainable as they are now. Her mother was basically losing her mind, and there was nothing she or her family could do about it. They took as that’s just the way things were. My grandmother eventually got married, moved to the United States, and began her own family. She visited her parents often, but with each visit her mother would struggle to remember her, and finally just didn’t recognize her at all. My grandmother was saddened by this and stopped visiting altogether. The last time she saw her mother was at her funeral. I heard this story many times, and my grandmother would tell me how she wished and hoped and prayed that she would not fall victim to the same fate as her mother. I would always reassure her that she would be fine and not to worry. In early 2010, I was visiting with my grandmother and I asked her to tell me stories of her childhood. She could not remember any. Throughout the year, she was becoming more and more forgetful. I would watch her and remember the stories she would tell me of her mother. My grandmother was diagnosed with Alzheimer’s disease in February 2011. By this time she struggles to remember a lot of the family members, and wakes up sometimes not knowing who she is, where she is, or how she got there. But she does remember me. Sometimes she doesn’t know how she knows me, but she tells me she knows I’m there to look after her. I have come to accept that my grandmother has Alzheimer’s disease. I have done research, and educated myself, family members, and to the severity of this disease. 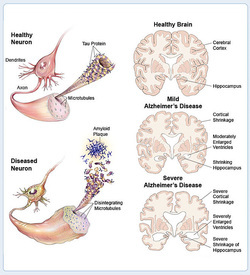 Alzheimer’s disease is a progressive brain disorder that damages and destroys brain cells. It usually develops slowly and gets worse as more brain cells die. Ultimately, Alzheimer's is fatal, and has no cure. Loss of connections among brain cells responsible for memory, learning and communication. These connections, or synapses, transmit information from cell to cell. Risk genes increase the possibility of developing the disease but doesn't mean you will inherit the disease. APOE-e4 is a rick gene associated with Alzheimer's. Everyone gets some form it from their parents. Those who inherit one copy of this gene are susceptible to the disease, and those who inherit two copies are at even greater risk. Studies are being conducted to find treatment to slow, stop, prevent, or even cure the disease. I have explained to my grandmother many times about her disease. Sometimes she understands, sometimes she doesn't. I will sit with her and tell her the stories she used to tell me. I let her know that I will retell her stories to my children. She tells me that is a good idea and to let them know who she was and is.